I worked on a lot of projects, but most of them were crochet. 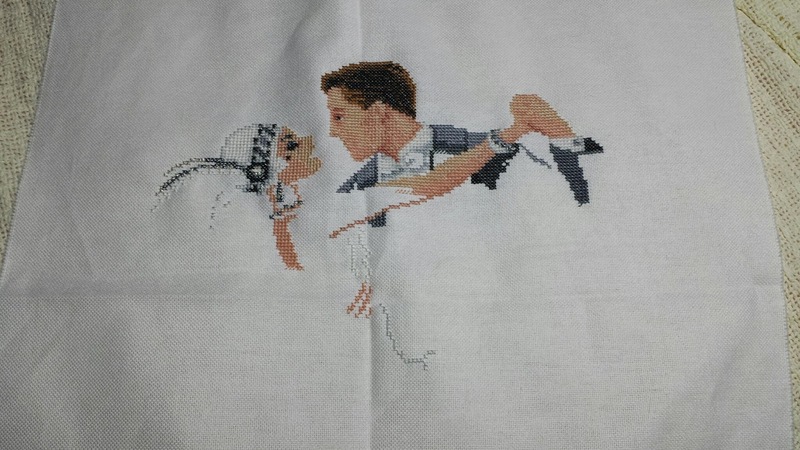 I did however start and work on one cross-stitch piece, Dancing Couple. Plus a placemat (still have to finish the other ones). I also bought a yarn winder, and worked on some other projects. I worked on four projects this week. Only three of which I have photos. First up, my cross-stitch. My tunisian tee, which for some reason has the wrong orientation. And the last picture is of the dragon filet. The one I don't have a photo of is the neapolitan ripple afghan. 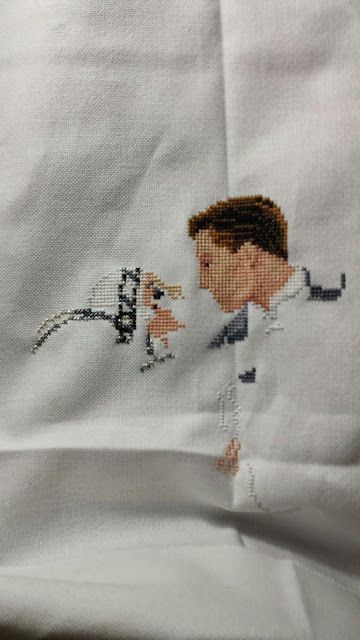 A little bit of cross-stitch too. Started 'Dancing Couple' although my focus this week was still crochet. These were my two main projects for the week, both I was having trouble figuring out the patterns. Dragon filet and the tunisian tshirt. The dragon had a small mistake and with the tee, the loop on the hook already counted as the first stitch. I tried starting the Ocean Vista dress but I'm having trouble with the motif pattern beyond the small size. It doesn't help that the pictures I can find are not for the larger sizes. The directions for one row are making it unsymmetrical. I also bought a yarn winder because I had to make size 10 skeins be center pull balls. So they went from looking like the ones on the left to the ones on the right. So much nicer, and quicker, than my own hand wound balls. I'm still on a crochet kick. After all, I keep ordering yarn. This was supposed to be my last batch, but I missed a crochet thread color and also, I'm running out of yarn for this top. And I had wiped out Joann's when I bought the three skeins (should've been 4 for this size unless I messed up somewhere). But, I did manage to finish not one, but two things I bought yarn for. First up, a little bag. I have put beads on the ties to make sure the drawstring is secure since I took this picture. And then the afghan I showed you last week. Probably needs a bit of blocking. The border was a pain. I frogged it several times because even with the corrections I still think they were slightly off. But I managed to have a complete skein of yarn left over. Enclose my credit card in a block of ice. I bought entirely too much yarn this week. 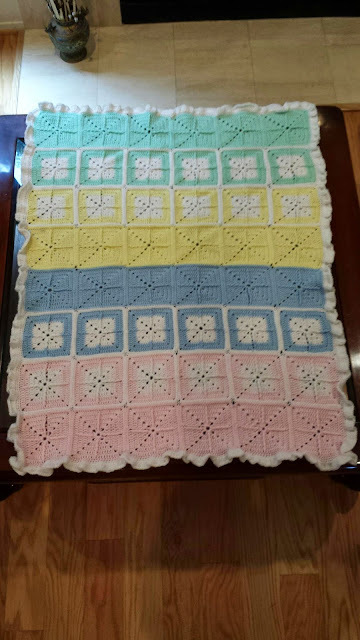 But first, I finished the baby blanket. 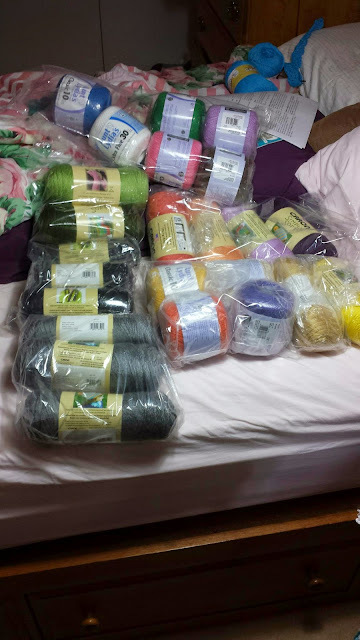 As for yarn, below is a what has arrived at my house so far. The top photo is what I bought at Joann's and Michaels'. The bottom is what I ordered for that dress I showed you a picture of last week. I also have more which should arrive Monday. Except for the pile on the bottom (not including the blue over on the left), and the ruffle yarns on the upper right, they are all for specific projects. Namely the following (free) patterns found via ravelry or the maufactuer's site. Can you tell what's for what and hasn't arrived yet? Now excuse me while I hide my credit card and wait for my other yarn to arrive.